I’ve finally finally finished E’s socks! YEA! I don’t know why these socks took me so long. I like the yarn. I like the pattern. Certainly I like E. It will remain a mystery. I did feel more inspired toward the end and knit like a madwoman with needles flying until I got them finished. I couldn’t decide on what I wanted the top to look like. In the end I went with a simple roll. I like the way it looks and I’m happy with the result. I did a bit of rib at the top, as I didn’t think that the lace would pull in enough to hold the socks up. Kit toe-up, two-at-a-time from Blue Moon Fibers Soft Rock in a colorway called â€œMermaid.â€ I used a pair of Addi Turbo circular needles in size US # 1. The toe is the “fan toe” from Queen Kahuna’s Crazy Toes And Heels Sock Book. 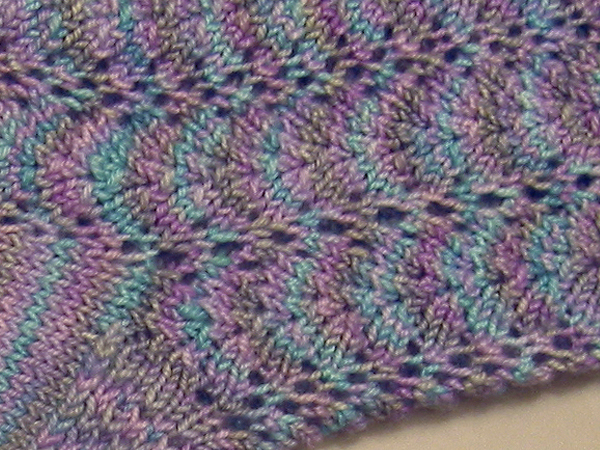 In a happy accident (wish I could say I planned it), the line of increases in the toe just matches the lace pattern. Click on the top picture to see the bigger version, and you can see the line of increases marching up the toe to the lace. The heel is Eye of Partridge. 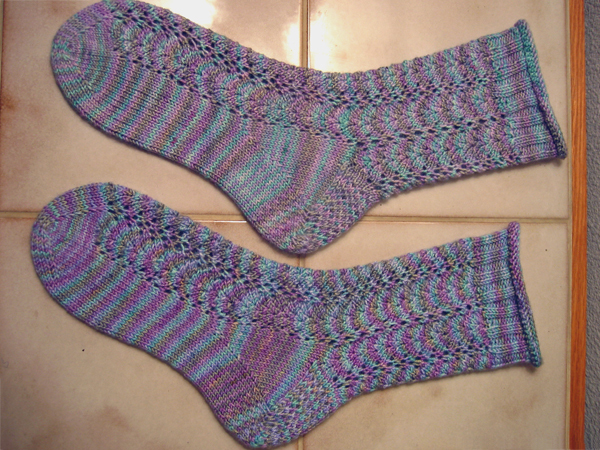 The lace is a vine pattern that I “borrowed” from the book Socks Socks Socks. Except I knit it upside-down because the original pattern is top-down rather than toe-up. And I used my own sock pattern not the one in the book. I don’t really care for the way the colors pooled just in front of the heel, but at least both socks pooled in exactly the same way, with a green pool on one side and a purple pool on the other. I’m now starting on a mystery project (shh… don’t tell). And then I’ll start on Clapotis # 2. And finish the sweater, of course!